shuffleboard story and a picture of all of the Zephyrhills players. 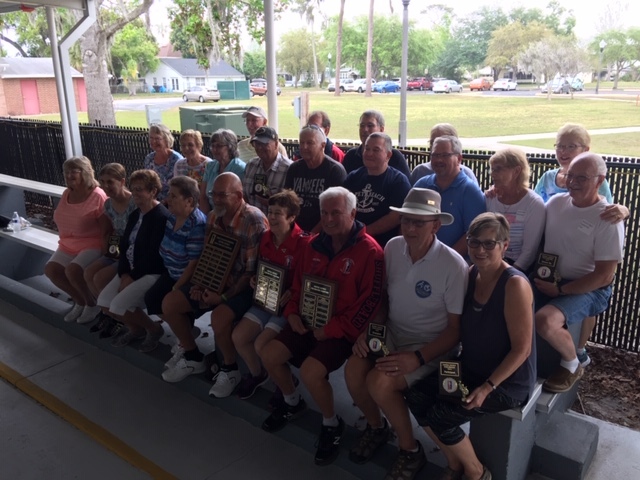 Zephyrhills, the Home of Shuffleboard Champions, qualified 21 of the 48 players in six divisions to take part in the Florida Shuffleboard Association Central District “Masters”. The Tournament was held in St Cloud starting March 14th and finishing March 16th. Zephyrhills Champions were Frank Pogel, District Amateur Men, who has only been playing since last June. Gerrit Dykman, St Amateur Men, who finishes up the season as the Amateur Representative for the Central District. Glenda Brake, Pro Women, who will also represent Zephyrhills in the State Masters. Earl Ball, Pro Men, who won his 8th District “Masters” and will also represent Zephyrhills in the State “Masters”. Zephyrhills had the Runner-up in the two Divisions it did not win. Karon Lightner, District Amateur Women and Diane Beaulier, State Amateur Women.